Gossip Girl: "The Lost Boy"
Secrets! Lies! Sabotage involving high-priced auction items and fine champagne! We didn't get Gossip Girl at its peak tonight, but the stagnant waters of the third season's first two episodes were definitely churned, and the show is starting to look like its sudsy self again. And though Chuck was denied a chance to say "I'm Chuck Bass" at episode's end, he did get one great line in: "She stole my shoes?" But before we get to stolen footwear, secrets: Scott opted to keep his, stopped just short—by his adoptive mother—of revealing to Rufus that he's Rufus and Lily's love child. Wracked with guilt (or perhaps realizing that he's not prepared to live with the fact that he was possibly conceived in the presence of Dave Navarro), Scott deflated the episode's big reveal by furthuring his and his mother's lying ways, telling Rufus that he'd been hanging around the Van Der Woodsen penthouse so often because he wanted to meet the father of his dead stepbrother. The near confession is squeezed out of Scott by Vanessa, who discovers that he's not only the spawn of Lincoln Hawk, but also hanging around NYU under false pretenses—turns out he's not enrolled in the university, hence the poor professor advice from last week. As Scott prepares to head back to Boston, Vanessa, being the ethical and annoying person she is, makes him promise that he'll return to New York one day to tell Rufus and Lily the truth. But she probably shouldn't have been talking about it so loudly, because she lives down the hall from a just-spurned-by-Dan Georgina Sparks, who immediately packs her Red Sox hat and baked beans for a trip to The Cradle Of Modern America, where she's likely to remotely wreak havoc on the Humphrey-Van Der Woodsen clan. Despite a well-laid plan which preyed on both Blair's need to be accepted at NYU and Chuck's desire to succeed at business without really trying, Georgina is forced to switch targets after her sabotage-of-the-week was thwarted by a surprisingly on-the-ball Serena. While she hasn't been dating Carter Baizen long enough to know that he doesn't take his Scotch on the rocks, she can tell that when Blair-Chuck (Bluck? Chlair?) is willing to put its fiery relationship on the line for a photograph, Georgina must be stringing them along. It was far too easy for the twin terrors of the UES to fall for the old "club magnate and secret society both want the same photo" trick, seeing as they were also occupied with staging various embarrassments for Carter. Hell, they were so distracted by those plans and one another that in the episode's big auction scene, Serena bid the prized photo out from under them. 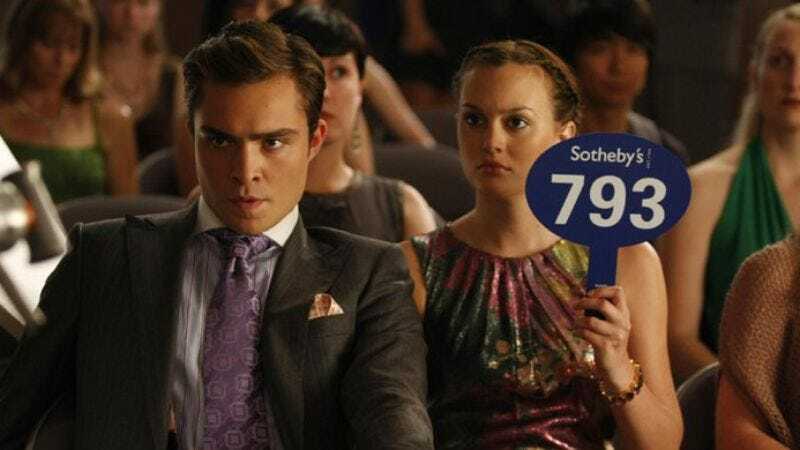 Blair complained throughout the episode (and her tightly-wound hairdo confirmed) that Chuck was putting the speakeasy before his girlfriend, but we all know that a million nights in a million hotel rooms stocked with a million bottles of '95 Dom Pérignon will never give them the same level of satisfaction as putting out a fake warrant for Carter Baizen's arrest. (And it looks they'll soon be testing that theory, following Chuck's talk of selling his shares in Bass Enterprises in order to buy his own hotel.) Even so, their commitment to one another was confirmed when Blair asked Chuck how he could be so sure about moving into the hotel business, and Chuck responded not with an assertion of his awesomeness, but with a simple "Because you believe in me." They're allowed these tender moment so long as they're balanced out by moments like Blair running out the door with Chuck's shoes, thus leaving him unable to race her to Sotheby's. The Dan-Georgina romance accelerated too quickly to ever reach that level—unless the one-week anniversary is now the "custom desktop background" anniversary—and Dan. It's not in the best interest of a newly appointed campus deity to date crazy in the form of Nona Mecklenberg. Besides, young Humphrey has another former child star on his horizon. The episode's simultaneous dances of deception led to another third season episode that was better than the one that came before it. There was a lot of talk about trust—especially between Serena and Carter—but on a show like Gossip Girl, a little bit of that stuff goes an awful long way. Let the lovebirds feel as though they can fall back on their partners for a little while longer, so long as all parties involved have one person at which to redirect their wariness; going into the next set of episodes, that one person is Georgina. Given her track record and the secret she's taking with her to Boston, that wariness is well placed. More valuable than any trust fund, carrying more caché than the highest level of social standing, secrets are the true source of power in the Gossip Girl universe. -Next week's other big guest star: Tyra Banks. She can't turn the episode into a tribute to all things Tyra if she's not playing herself, right? -Let's start a movement to re-christen a neat Scotch as a "Carter Baizen." Then, one day, you can sidle up the bar at your favorite watering hole, and place your order like this: "CARTER BAIZEN!" -I left Nate and Bree out of the recap again because it's like they're not even part of the show at this point. They decided to go to the auction so Bree can meet Nate's friends, but then we never saw them interact with the rest of the principals. Were it not for their flirtations in front of the paparazzi or Bree's brief interaction with Carter, I'd guess that she and Nate were dead, and their spirits now haunt the five-star hotels and world-renowned auction houses of Manhattan.